GT-Command is doing the monitoring and the automation, and the basic core informations as to-day. If you have other control commands SW GT-Position can interface to them. GT-Position - How does it help you? 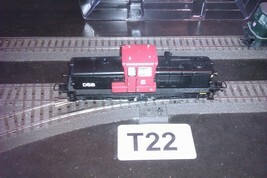 GT-position is your GPS for your model trains. Each train has a unique LocoID. GT-Position draws your layout. Let one Loco which has a sender drive all your tracks one or two times slowly. You can control the Loco manually, using voice control or using automatics. The Loco plots all posititions very tight on the screen. Then you use your mouse to correct some ares like tunnels and other hidden tracks which are not drawn with good precission. Finally GT-Position builds your track layout as a graph. The graph is geometrically correct. When the track layout is build you can put any train with a sender on the track, and GT-Position will plot the position on the track pretty precisely. Both Loco name, LocoID, and direction will be shown and you will see your trains like any GPS would do it. Speed and other information will be added as well. On your track layout you can insert "Virtual blocks". These blocks are just drawn with a mouse, no wires, no cutting, no isolation. When you drive the GT-Command automation program can control your trains based on feed back from the virtual blocks. GT-Position knows exactly what trains passed what section and thus you can have a very fine tuned automation program. As an example: Only the steam Loco sends out a whistle when it passes the crossing, while Diesel does somthing else. Or switch the turnout only if the diesel engine is passing. You can move/add/delete your virtual blocks as you like, just ensure they are listet in the block table. Going forward also position of your turnouts and signals can be shown on the graph. GT-position offers very intensive operation with more trains on even small layouts. As an example also intense games with more Locos can be controlled. The automation program has been extended in order to utilise the GT-Position power. Below 4 changes make it more easy and fun to run your layout. 1) The condition NLW means: Let the program wait doing anything more until the following condition is fulfilled. A normal command is NLW B4 Occupied, which waits until B4 to become occupied by any train. Or NLW B4 free waiting for B4 to be empty. In V 3.1 we already inserted a new condition: NLW L21 B4. It expressed that we wait until exact loco L21 will occupy B4. It does not help that L1101 occupy B4 or any other loco. The method is used to make individual train control. and trainautomation. 2) In version 3.1.1 a new variable LBxx, i.e. LB4. LB4 contains the LocoID for the loco which in this very minute occupies B4. It can be used to cut off all sounds on a trains on their roads to the fiddle yard, or turning on sound or light of speed steps for the train currently in B4. Pass a crossing and whistle. Should not be that hard, however with GT-Position just a SW function. And you can put in as many as you want without any extra HW. NLW B4 occupied "wait until B4 become occupied"
LB4 whistle on "Whistle for 1 second"
pause 1 "wait 1 second"
LB4 whistle off "Cut off whistle"
repeat "wait for a new train"
You can extend with all other kinds of devices and lok functions and speed/brakes. 3) I version 3.2 we also extend with a standard block control function: FBF: The principle is not to advance in the current block until the next block is free. Condition is that there is no train in the following block. If so the train stops and waits. Red light/green light can be associated. NLW B3 occupied "we wait until B3 becomes occupied by any train"
FBF B3,B4 "Drive through if B4 is free otherwise stop and wait until B4 is free." Repeat "go back and wait until a new train occupies B3, or test again for the same train if his was an accident"
See the quick guides for more details, you can also omit the first line if you want a real red signal behind setting. 4) I version 3.2 also follows a new fiddle yard control FFR which automatically can detect a free block and drive the train to this block. There will also be a function for driving the train back from the fiddle yard. See the quick guides to understand this. In principle FFR looks at a list of blocks and associated routes. It selects the first free route and the associate route will be switched. Then the train can drive on to through this route to the free block. The driving and the driving steps are programmed by the user. The target blocks is named $ and that be used to decide when to stop.